Brightener or the amount present in a bath is hard to determine. The only way to accurately determine this is to have the bath analysed by a laboratory. This is not an option available to most platers, so the only option is to visually inspect the results. The plating results will gradually become dull in appearance and this will indicate the need for more brightener. As you gain more experience plating you will soon recognise when the bath requires more brightener. 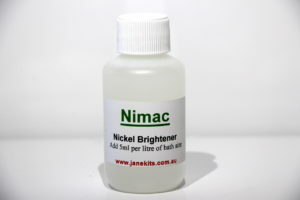 The Nickel brightener is known as Nimac. When you first mixed your nickel chemical you add 5 ml of Nimac per litre of the final bath volume. For example, if you ordered a 4 litre Nickel Kit, you would add 20 ml of Nimac initially. 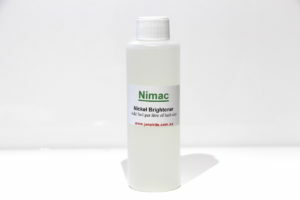 The Nimac brightener depletes after you have done a day or two of plating. Monitoring the plating results will assist when diagnosing the level of brightener in the bath. When the plating starts to look a bit dull, it is time to add more brightener. Not too much as overdoing it is as bad as not having enough in the bath. Do not add the full amount of brightener when topping up the bath. The brightener has only depleted in the bath, it has not completely disappeared, so adding the full amount is not necessary. Start by adding approximately 1/4 of the recommended amount. 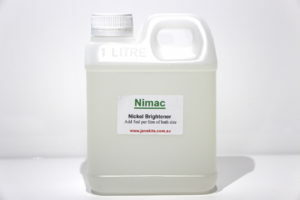 For example, if you need to add more brightener to a 4 litre Nickel bath, add approximately 5 ml of Nimac in total and mix through. Electroplate a test piece for 10 minutes and see if the brightness levels have returned. If they have not returned, add another 5 ml and test again. If your results have still not improved your problems may be actually caused by another issue i.e. too much current or poor preparation etc. Continuing to add more brightener may not assist in rectifying your poor plating results. Check all electrical connections and ensure correct preparation techniques have been carried out. 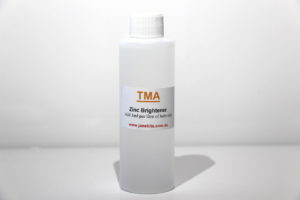 The Zinc brightener is known as TMA and is highly concentrated. TMA is more concentrated than any of the other brighteners. 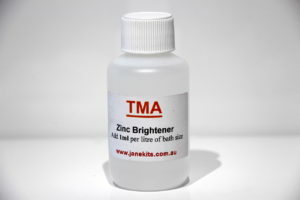 When you first mix your zinc chemical you add 1 ml of TMA per litre of the final bath volume. For example, if you ordered a 4 litre Zinc Kit, you would add 4 ml of TMA initially. 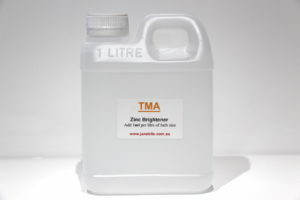 The TMA brightener depletes with use. The TMA is a bit more critical than other plating chemical brighteners, it depletes faster. When the plating starts to look a bit dull, it is time to add more brightener. Not too much as overdoing it is as bad as not having enough in the bath. Not over brightening your Zinc bath is critical to Passivating. Do not add the full amount of brightener when topping up the bath. The brightener has only depleted in the bath, it has not completely disappeared, so adding the full amount is not necessary. Start by adding approximately 1/2 of the recommended amount. For example, if you need to add more brightener to a 4 litre Zinc bath, add approximately 2 ml of TMA in total and mix through. Electroplate a test piece for 10 minutes and see if the brightness levels have returned. If they have not returned, add another 2 ml and test again. If your results have still not improved your problems may be actually caused by another issue i.e. too much current or poor preparation etc. Continuing to add more brightener may not assist in rectifying your poor plating results. Check all electrical connections and ensure correct preparation techniques have been carried out. NOTE: If you are Passivating your parts ensure you do not over brighten your Zinc bath. An over brightened Zinc bath will not be an issue if you only require a bright Zinc finish. However, if you are attempting to Passivate your parts after they have been plated in an over brightened Zinc bath you will have issues with adhesion of the Passivate. Not over brightening your Zinc bath is critical to Passivating. Failure to follow this will ensure the passivate will not adhere to the surface of the Zinc plate. If you do find yourself with adhesion issues while attempting to passivate, do not add any more brightener and continue to plate items that require a Bright Zinc finish only. Eventually, you will plate out the excess brightener and can continue with Passivating items required. 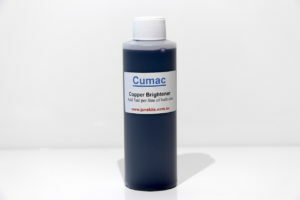 The Copper brightener is known as Cumac. When you first mix your copper chemical you add 5 ml. of Cumac per litre of the final bath volume. For example, if you ordered a 4 litre Copper Kit, you would add 20 ml of Cumac initially. When it comes to standard Acid Copper Electroplating, the Copper brightener is not very critical. The Cumac brightener does deplete after you have done a lot of plating but you will find you will not be required to add as much or as often as other plating chemicals. Monitoring the plating results will assist when diagnosing the level of brightener in the bath. When the plating starts to look a bit dull, it is time to add more brightener. Not too much as over doing it is as bad as not having enough in the bath. Do not add the full amount of brightener when topping up the bath. The brightener has only depleted in the bath, it has not completely disappeared, so adding the full amount is not necessary. Start by adding approximately 1/4 of the recommended amount. For example, if you need to add more brightener to a 4 litre Copper bath, add approximately 5 ml of Cumac in total and mix through. Electroplate a test piece for 10 minutes and see if the brightness levels have returned. If they have not returned, add another 5 ml and test again. If your results have still not improved your problems may be actually caused by another issue i.e. too much current or poor preparation etc. Continuing to add more brightener may not assist in rectifying your poor plating results. Check all electrical connections and ensure correct preparation techniques have been carried out. 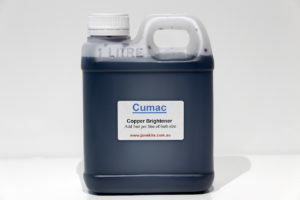 The Electroforming Copper brightener is also known as Cumac. When you first mix your Electroforming Copper chemical you add 5 ml. of Cumac per litre of the final bath volume. For example, if you ordered a 4 litre Electroforming Copper kit, you would add 20 ml of Cumac initially. Electroforming Copper plating is completely different to standard Acid Copper plating. The Copper brightener will deplete rapidly in an Electroforming Copper plating bath. The Cumac brightener does deplete after you have done a lot of plating but you will find you may not be required to continue to add the Cumac. Most Electroforming will require the items to be plated for many hours to assist in building up the thickness of the copper plate. During this build-up stage, it is not as critical to have a bright Copper finish. The Copper finish will be a salmon colour when the bath is depleted in Cumac brightener. When the item being electroformed has enough copper plate build-up on it, adding more Cumac to the bath and plating the item for a further 10 minutes will create a layer of bright Copper plate. If you are attempting to achieve a bright Copper finish all of the time, then monitoring the plating results will assist when diagnosing the level of brightener in the bath. When the plating starts to look a bit dull, it is time to add more brightener. Not too much as overdoing it is as bad as not having enough in the bath. Do not add the full amount of brightener when topping up the bath. The brightener has only depleted in the bath, it has not completely disappeared, so adding the full amount is not necessary. Start by adding approximately 1/2 of the recommended amount. 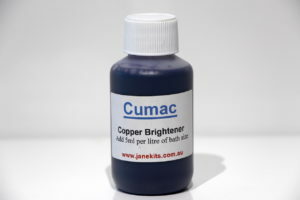 For example, if you need to add more brightener to a 4 litre Electroforming Copper bath, add approximately 10 ml of Cumac in total and mix through. Electroplate a test piece for 10 minutes and see if the brightness levels have returned. If they have not returned, add another 10 ml and test again. If your results have still not improved your problems may be actually caused by another issue i.e. too much current or poor preparation etc. Continuing to add more brightener may not assist in rectifying your poor plating results. Check all electrical connections and ensure correct preparation techniques have been carried out.